What is an auto bill of sale? It is a legal agreement between yourself and the party you wish to do your automobile transaction with. 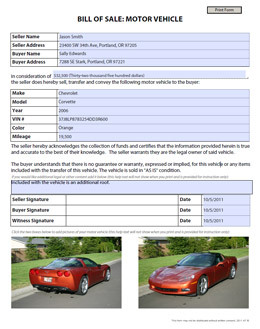 If you are selling your automobile and need a bill of sale form to complete the transaction, we have you covered! 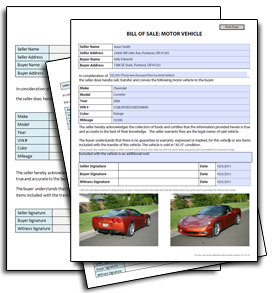 These forms are relatively basic and assume the automobile is being sold in AS IS condition. Simply open the bill of sale PDF form below, fill in the necessary fields, print two copies and have both parties in the transaction sign. Additionally note that these free bill of sale templates offer the ability to add two pictures representing the property in the transaction. This is an optional part of the form and can be left blank if you don't have pictures available. 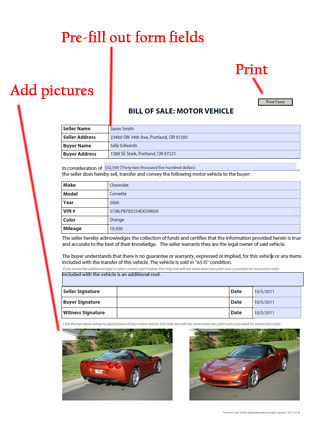 Below we layout a couple simple steps to download and create your auto bill of sale form. In step one download the bill of sale pdf, in step two complete the form entry as shown in the sample below, then print with the button on the top right of the form. Please be patient while downloading the auto bill of sale forms as the file sizes may cause it to take a moment depending on your connection speeds. Once you have successfully opened your auto bill of sale form into an Adobe Reader software product, you can begin filling all the form elements shown in light blue to the right. As a final step you can optionally add two pictures of the automobile at the bottom of the page.